In attempting to put together their roster for the 2018-19 NBA season, the Miami Heat are focusing on trying to get under the league’s salary cap in order to avoid the assessment of a luxury tax. However, in their effort to rid themselves of three large contracts, they’ve yet to make any sort of headway because of their current unwillingness to sweeten any deal to take on those expensive pacts. “Two high-ranking executives with other teams said this week that Hassan Whiteside, Tyler Johnson and Dion Waiters have all been made available by Miami in trade discussions. 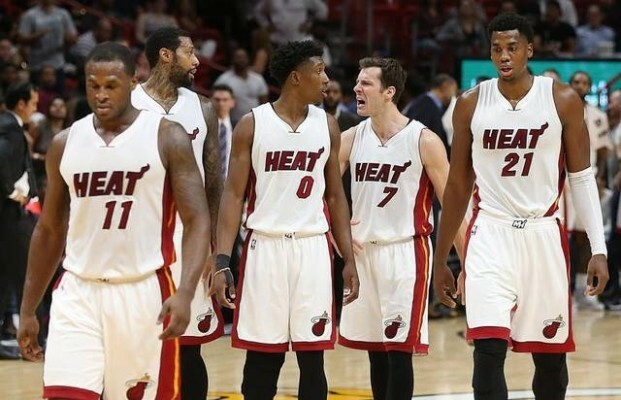 The chief reason for the Heat attempting to deal away the trio is the steep costs that remain on their books. Whiteside is due $51.5 million over the next two years, Johnson will be paid $38.4 million over that same time frame and Waiters has $36.3 million scheduled to come to him in the next three years. Jackson also noted that the Heat are currently scheduled to pay $4.9 million in luxury tax after the signing of Wayne Ellington and will owe over $10 million if they re-sign Dwyane Wade on a $5.3 million exception deal. The need to deal any of the aforementioned players isn’t immediate since that tax is based on the team’s payroll on the final day of the regular season, which is nine months away. That lengthy time span allows Miami plenty of time to reconsider its current position.